My paintings aim to express the sense of seeing 'beyond the usual' often experienced when immersed in the landscape. Playing with the movement and transparency of watercolour and mixed media, I try to create a sense of mystery, removed from the physical reality of the subject. Above all, it is the emotional energy which excites me evoked by my interaction with the forces of nature. The wilds of Dartmoor, the river Dart and the coastline of the South West are my inspiration. I am fascinated by how experiencing and observing the landscape and its ever changing elements connects us to the natural world and generates a sense of awakening, curiosity, wonder and well being. 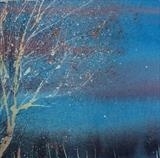 Breda is an established artist exhibiting in the South West of England. She has been teaching watercolour for nine years with an emphasis on a more intuitive approach to painting.